REGINA – The moments of brilliance were few, the moments of dullness many. 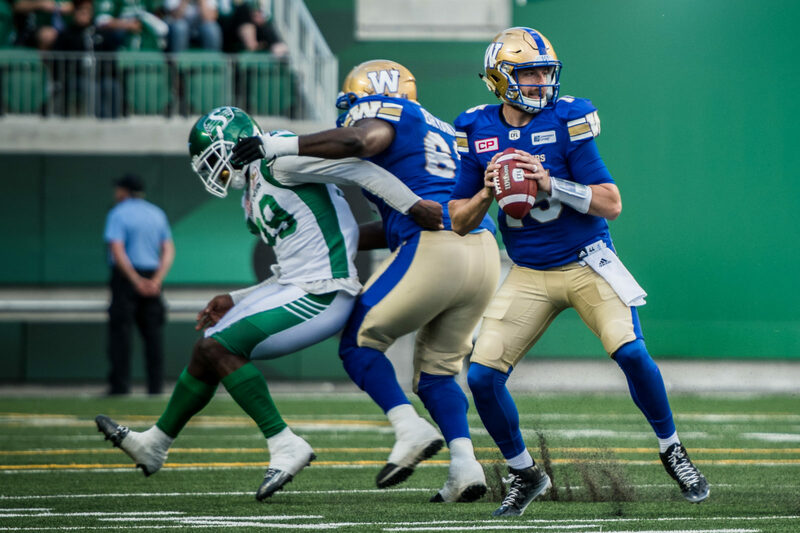 In other words, the Winnipeg Blue Bombers and Saskatchewan Roughriders didn’t exactly christen new Mosaic Stadium in style in Saturday night’s preseason opener, an affair that left many of the announced crowd of 33,358 desperately wishing to fast-forward to the regular season. The final, for what it’s worth: Winnipeg 25, Saskatchewan 25 (no overtime in the preseason). The vacancy at middle linebacker has been the most talked about positional battle since before training camp started, what with Khalil Bass now wearing Ottawa REDBLACKS colours. 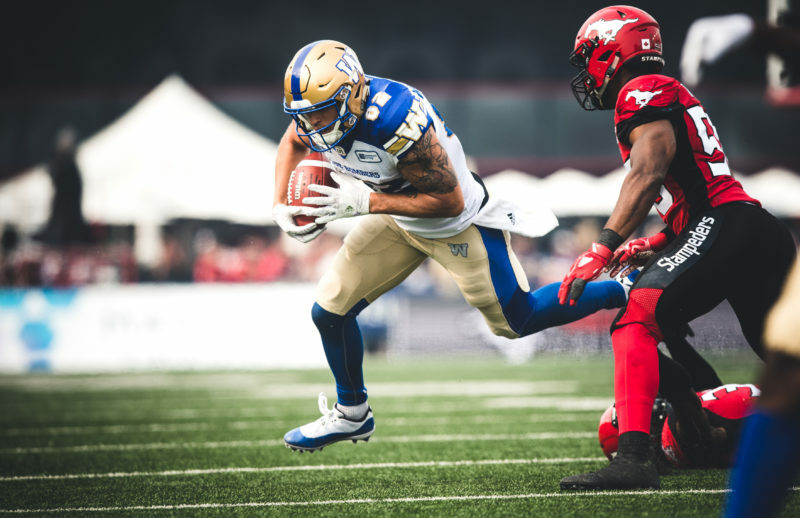 The Bombers arrived in Regina with veteran Canadian Sam Hurl still in Winnipeg – he’s taken a ton of snaps with the No. 1 defensive unit – and opened the game with Nick Temple manning the middle of the front seven. The Bombers ran a few candidates through the linebacker spots, including Knox, Temple, Kyrie Wilson and Julian Santos-Knox. Nobody popped off the page, although Santos-Knox did recover a fumble and lead all linebackers with three tackles. What is happening with Hurl’s increased workload at linebacker is indirectly related to the import talent the club has compiled at defensive tackle. It’s all-but a given that Drake Nevis, brought aboard in free agency after a solid season last year in Hamilton, will occupy one spot and the thinking has long been that the club would then use a combination of Canadians at the other spot. Jake Thomas didn’t make the trip, leaving Rupert Butcher and Faith Ekakitie, drafted first overall last month, to take some snaps against the Riders. 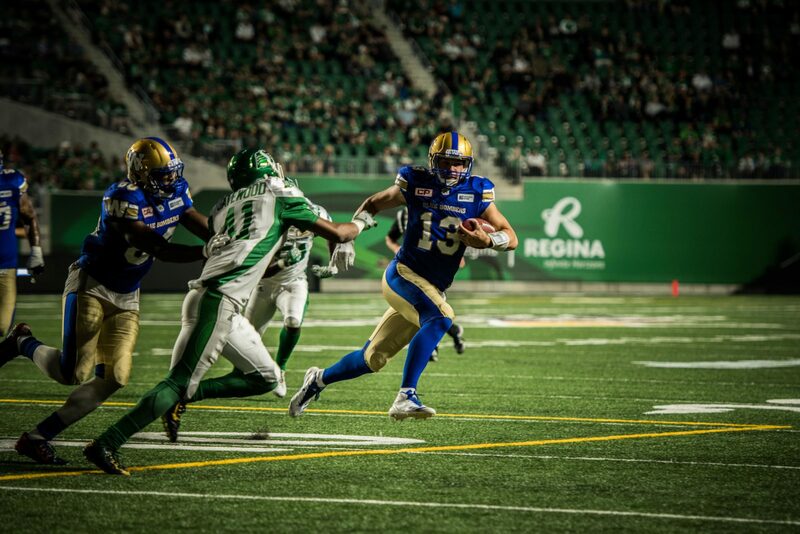 But the Bombers used a number of imports all night up front and making arguably the biggest impressions were Cory ‘Poop’ Johnson and Padric Scott, both of whom pushed their way into the backfield on occasion. Ekakitie got most of his reps in the second half and comes as advertised – as a run-stopper who admittedly needs to develop his pass-rush skills. 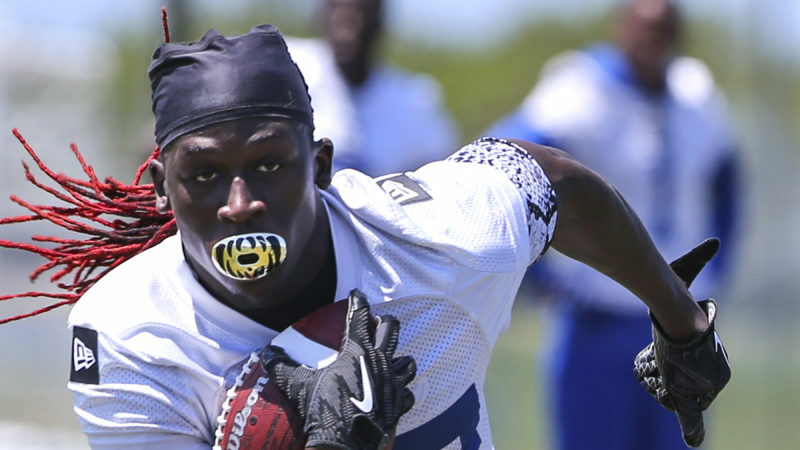 He got into the backfield for a pressure late in the game, offering a glimpse at what could be as he develops. Matt Nichols started and was five of eight for 82 yards in his stint before giving way to Austin Apodaca with 6:27 left in the first half. 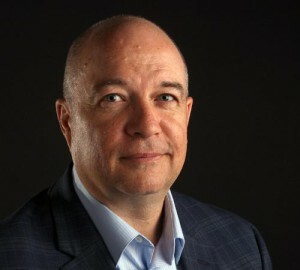 Nichols was working behind the Bombers No. 1 O-line and was sacked once, but the men up front did an otherwise solid job of providing protection. Apodaca, the hard-throwing rookie out of New Mexico, finished two of six for just 15 yards and looked to be making good reads, but rushing some of his throws. The No. 2 job behind Nichols is a battle between Dom Davis and Dan LeFevour, anyway, and Davis – who was brought aboard in 2015 – completed his first pass for nine yards and finished the night five for eight for 90 yards, including a 39-yard TD to T.J. Lowder. LeFevour entered the game with just under seven minutes remaining and immediately led the club on an eight-play, 75-yard scoring drive that was capped by an eight-yard TD to Ryan Lankford, the ex-Rider. He was at the controls for a second TD drive, connecting with Justice Liggins for an 18-yard TD inside the final two minutes and then with Larry Raper for the two-point convert. His final numbers were solid: seven of nine for 88 yards with two TDs. Both men were solid in their night’s work in the battle for No. 2: Davis showing more poise than in his one career start at the end of 2015 with LeFevour not fearful of putting passes into tight spaces. The answers as to which players will handle the return duties – both punt and kickoffs – had been a mystery heading into Saturday’s contest, what with Kevin Fogg yet to hit the field after offseason surgery and Quincy McDuffie having signed with the Dallas Cowboys and still apparently remaining in Texas even after his release. These gigs shouldn’t be considered afterthoughts, either. Consider that last season Fogg (59) and McDuffie (64) combined to return 123 punt and kickoff returns last season and that’s a ton of touches. Fogg is expected back at practice soon and could handle both chores, but Saturday night also offered the chance to see some other potential candidates. The biggest Bomber moment of the night in this department was a superb 70-yard punt return by Lankford late in the second quarter that was wiped out by a L’Damian Washington offside penalty. 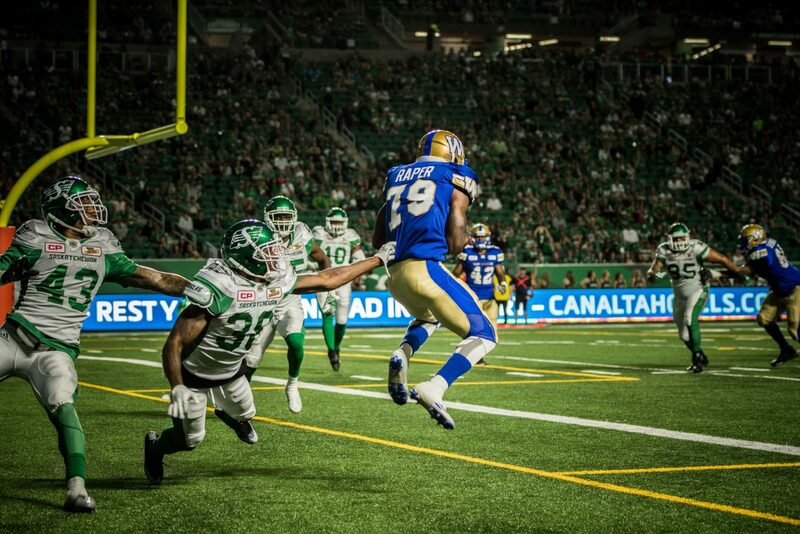 Both Lankford and T.J. Lowder put the ball on the ground in the return game – Lowder’s mistake recovered by the Bombers; Lankford’s by the Riders. The game featured three products of the Winnipeg High School Football League in Xander Tachinski (St. Paul’s) and Andrew Ricard (Elmwood), both now of the Winnipeg Rifles, and Derek Yachison (Murdoch Mackay), who is now with the University of Manitoba Bisons. Ricard took some snaps in the second quarter at safety with the Bombers defending just eight yards of turf after the Lankford turnover, while Tachinski got his first reps in the second quarter as well. It was Yachison who got on the stats sheet, finding a chemistry with Davis and pulling in a pair of passes for 33 yards. The Bison product hasn’t looked out of place since joining the club later in training camp and after injuries to Canadians Addison Richards and Matt Coates. Draft pick Félix Ménard-Brière was wide right on his lone field goal attempt – the snap was reportedly low – but made up for the gaffe by saving a touchdown in chasing down Quincy Walden. Ménard-Brière, you may recall, posted the fasted 40 time at the Montreal combine before the CFL Draft… Bombers DB Tahaan Goodman was ejected from the game in the first half after the Lankford punt-return fumble… Winnipeg posted some decent totals along the ground, with Timothy Flanders carrying five times for 33 yards, Nichols once for eight, LeFevour for nine, Davis one for one and Kendal Roberson – the impressive rookie from East Texas Baptist University – finishing with six rushes for 36 yards while pulling in one pass for 11 yards… Jackson Jeffcoat sacked Bryan Bennett late in the fourth, the ensuing fumble recovered by Shayne Gauthier… Bomber DB prospect Matt Smalley was called for late pass interference call that set up the game-tying field goal with four seconds left. 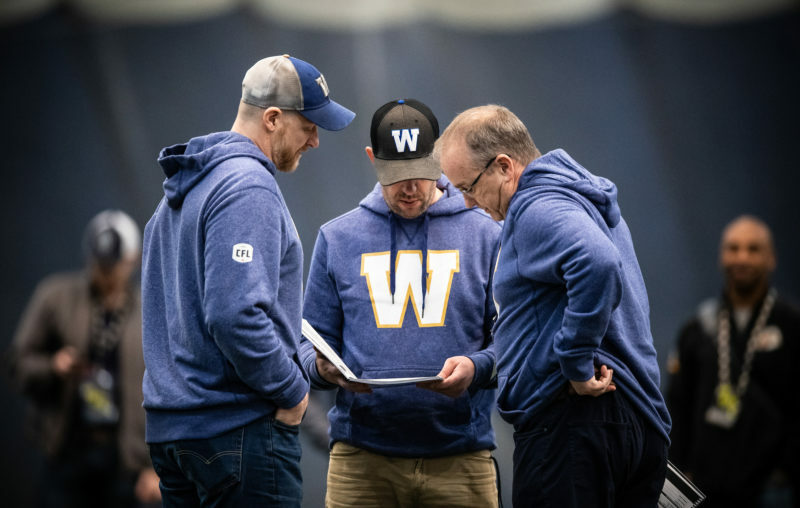 The Bombers don’t officially have to make any roster moves until the final cutdown on June 17th (not including the injured list). But with many of the starters who were left at home – Andrew Harris, Jamaal Westerman, Weston Dressler, Darvin Adams, Chris Randle and Ian Wild among them – expected to suit up for the final dress rehearsal next Thursday against the Edmonton Eskimos, Mike O’Shea & Co. might be tempted to reduce the herd a bit to better evaluate those fighting for starting jobs, roster spots and gigs on the practice squad.